4 Hawaiian plumerias for $35.00. 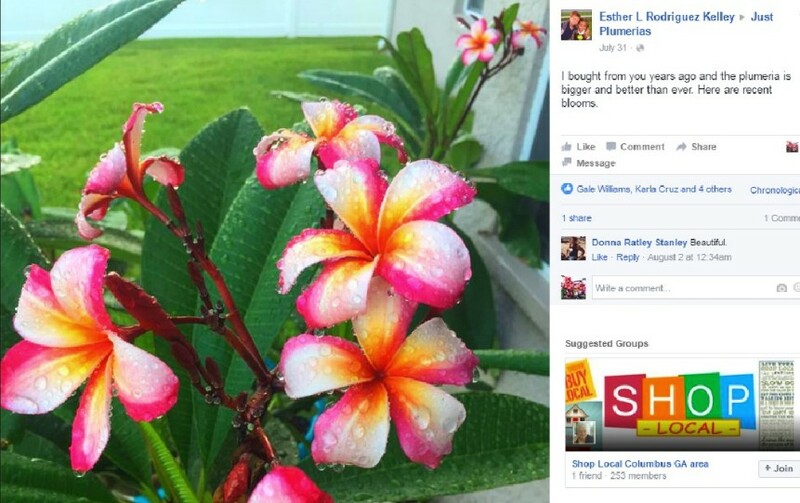 Become a Facebook member and receive a free Hawaiian Plumeria when you order a 3 pack. Make sure you become a Facebook member for our Facebook Special. 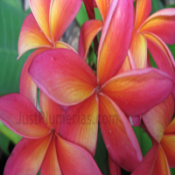 Just Plumerias has been showing the plumeria at Epcot for the last 21 years and, we ship all over the world. 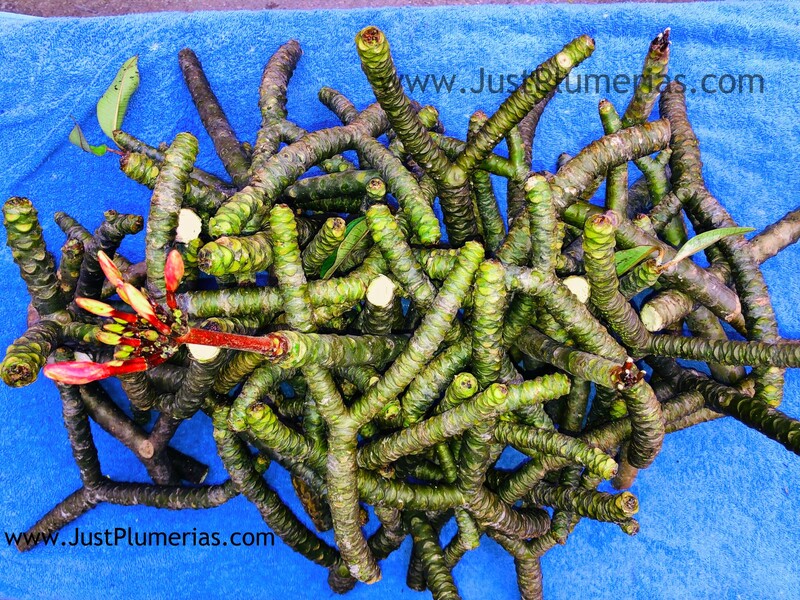 Just Plumerias' cuttings are Hawaiian grown. The hybrids we carry are very exotic and easy to root. Make sure you become a Facebook member for our Facebook Special. Just Plumeria over 13,000 members and growing. We just showed at Epcot for our 21st year in a row and we are on the bridge in front of Legoland at Disney Springs. 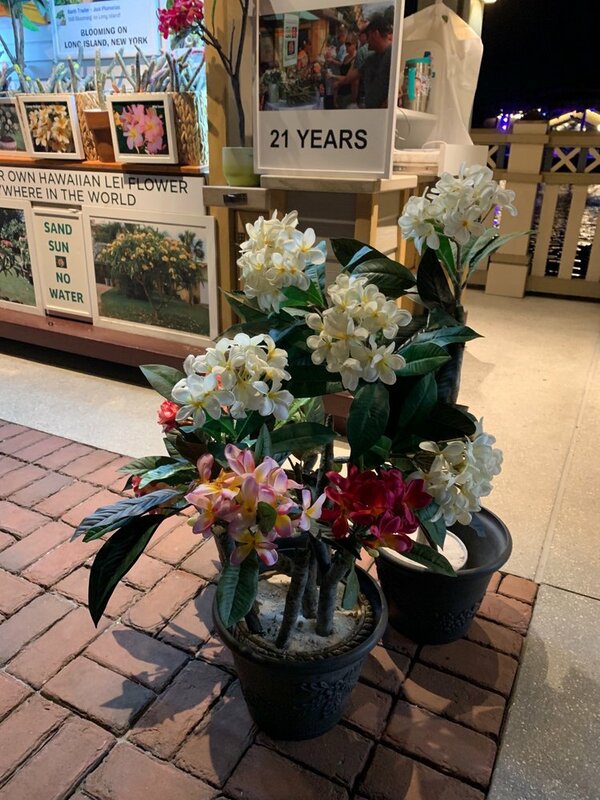 See Just Plumerias at the Winter Park Farmers market where have been showing every Saturday for 22 years. Celadine is the #1 cultivated plumeria. Fragrance is orange blossom citrus, with very thick petals. 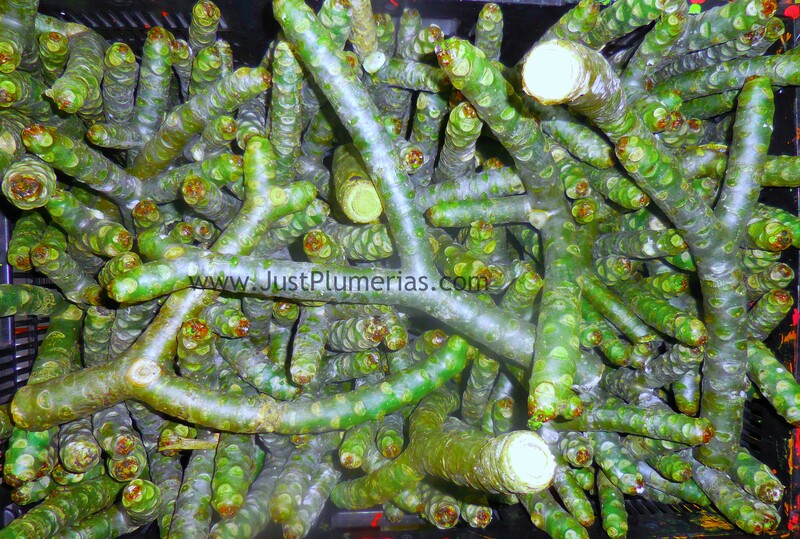 Very heavy brancher - Double and Triple tip cuttings. Lani's Beauty produces a magnificent, multi-colored, 3 to 4 inch, heavy textured petal and smells like roses with a hint of plumeria. It is a prolific bloomer and has an outstanding keeping quality. Very heavy brancher - Double and Triple tip cuttings. Wailea A Striking Bloom! Orange petal with a golden yellow throat. The overlapping petals have a curl on the edge. The fragrance is mild sweet. • You can also email us at aloha@justplumerias.com to place your order. The online ordering accepts all major credit cards. We ship by priority mail anywhere in the United States . 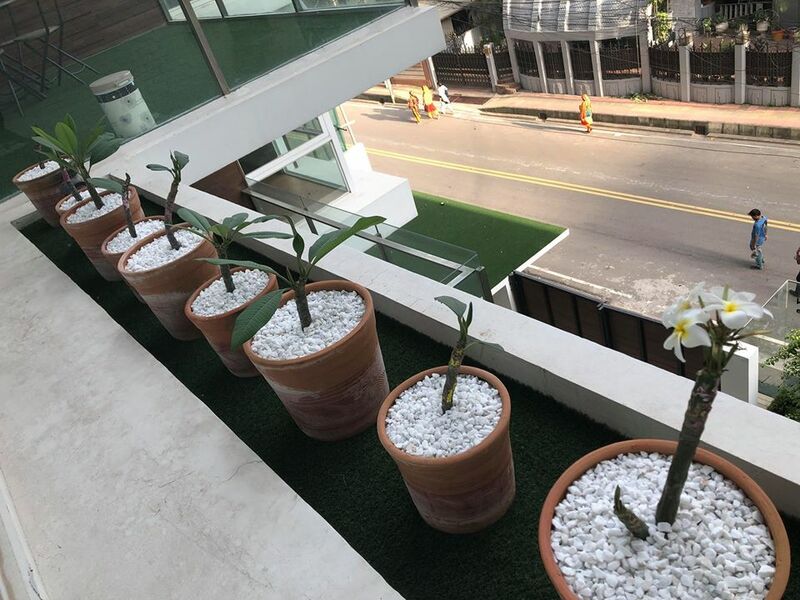 Each order comes with rooting and fertilizing instructions so you will have a nice rooted plumeria that will grow and bloom in a short time. Please include $8.50 for priority shipping for up to 3 cuttings. 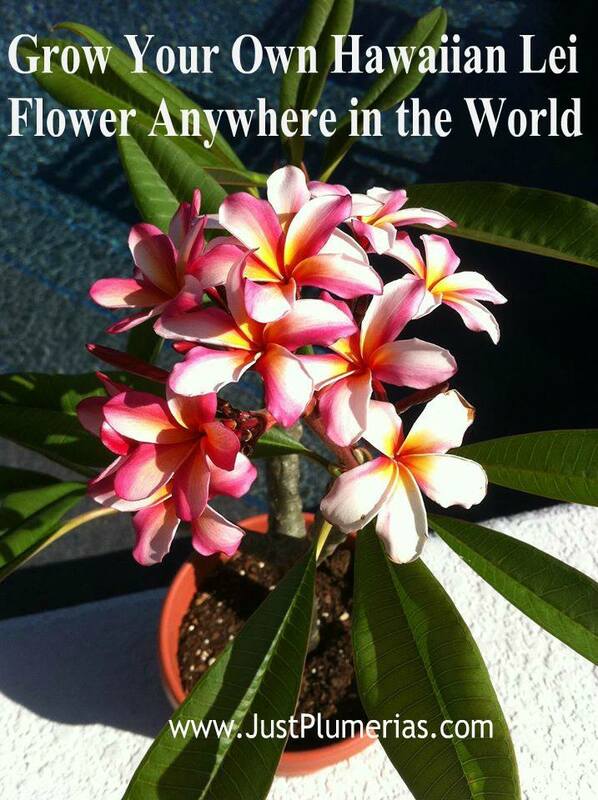 Grow Your Own Plumeria Anywhere in the World. "My Beautiful plumeria flowers. 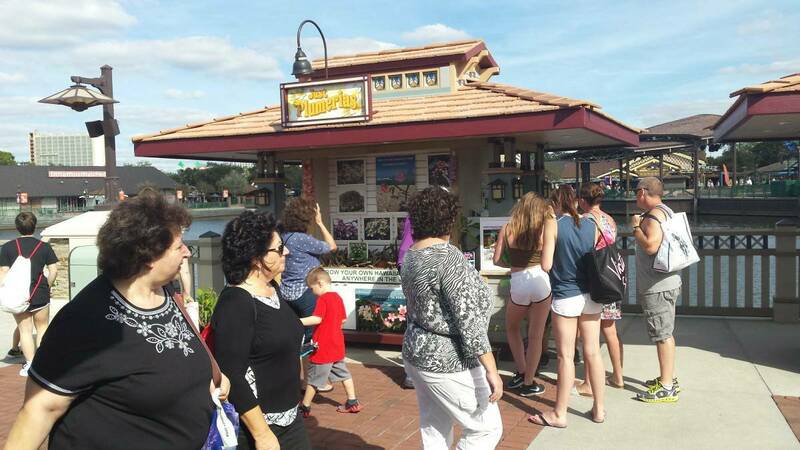 Purchased at the Epcot Flower and Garden show." 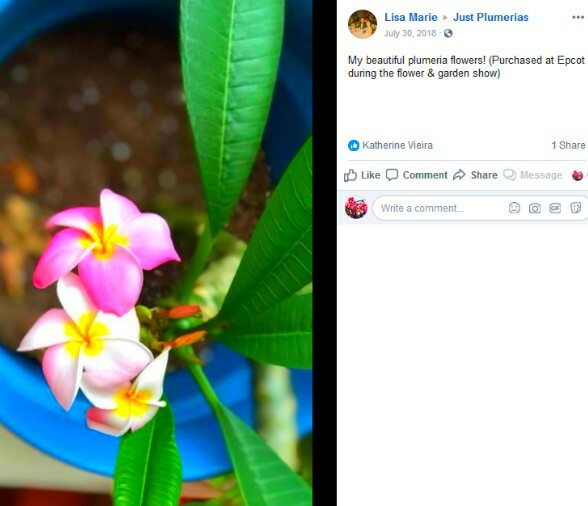 Lisa, Your plumeria picture looks great. Thanks for the business. Beautiful!! I bought 3 plumeria on a whim then went back for more plumerias!! They are SUPER easy to take care of and bloom so beautifully!! I absolutely love coming here! 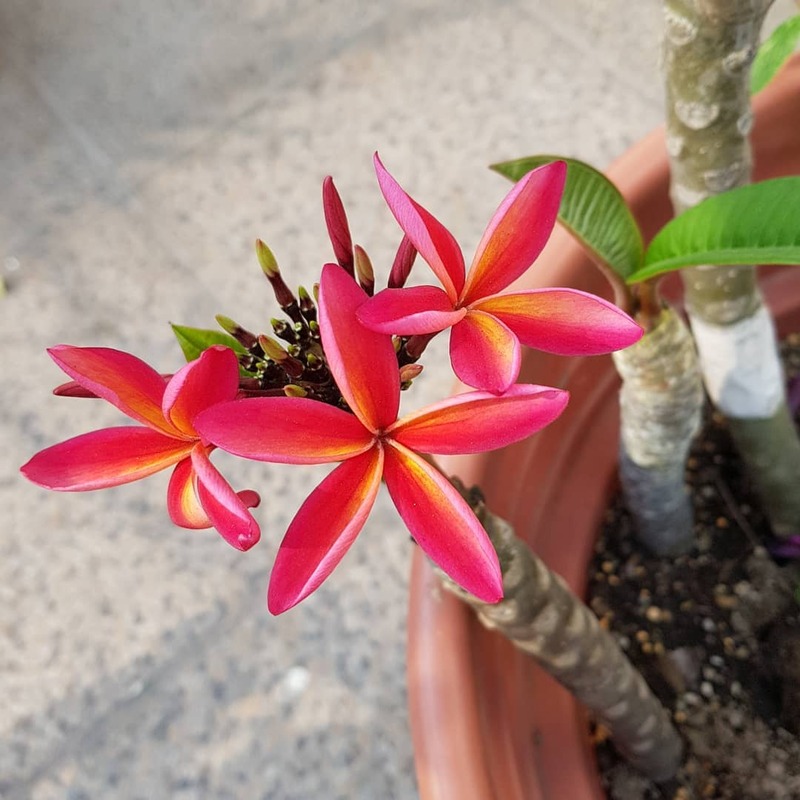 One of our Beautiful Plumeria hybrids one of our customers acquired from us. Shared on our Facebook page. "Imagine how much cooler I'll be... in Spring!" My plumeria are starting to bud again. 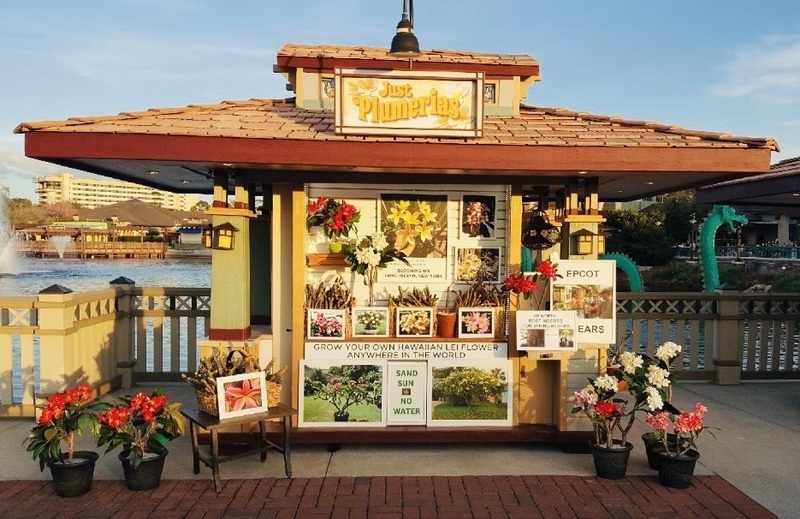 I recommend visiting the Just Plumerias booth, if you'd like to bring home a small piece of Disney Springs ! My Epcot purchase from Just Plumeria finally bloomed what a nice surprise and smell good!! Plumeria bought from us at Epcot and blooming in a very short time. The Celadine Plumeria Yellow smells like orange blossom citrus. 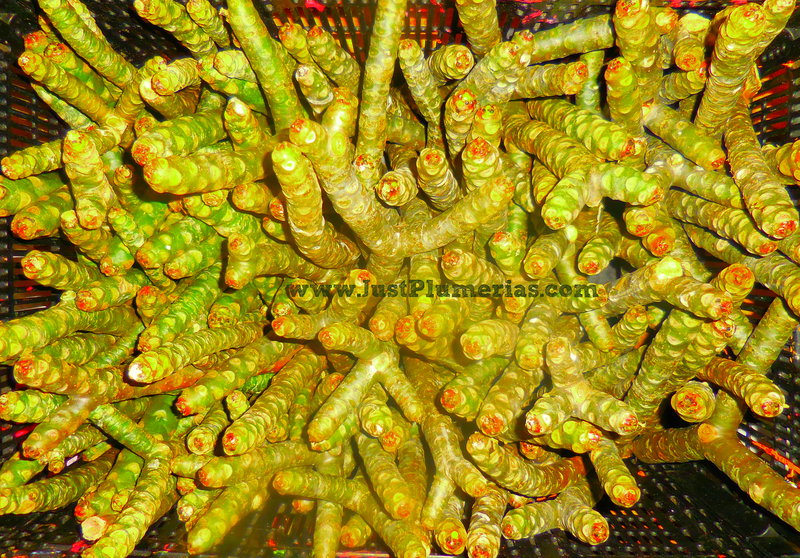 Our Hawaii Plumeria Cuttings are the best quality at the best prices. 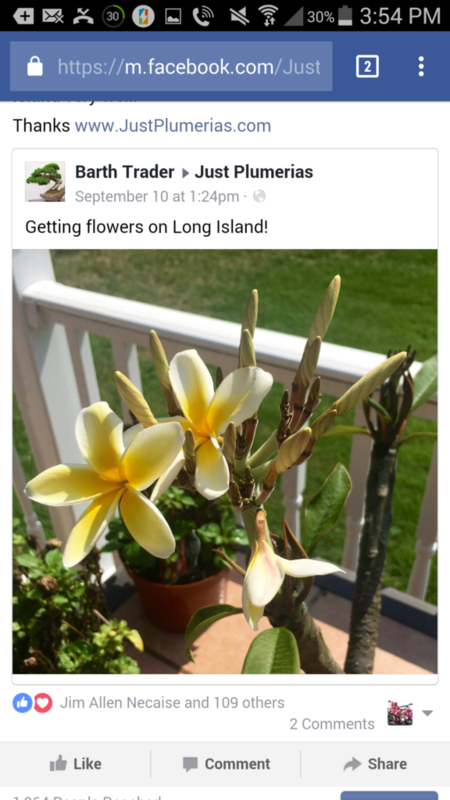 Thanks for the business Barth, the plumeria you bought from us looks great as a potted plant on Long Island, NY !!! I purchased 3 plumeria cuttings last fall from Just Plumeria, and have had wonderful luck with them. I am purchasing another promotion of cuttings and can't wait to get them started as well. This is a great source for these beautiful flowering plants. Thanks Just Plumeria for being a great source! 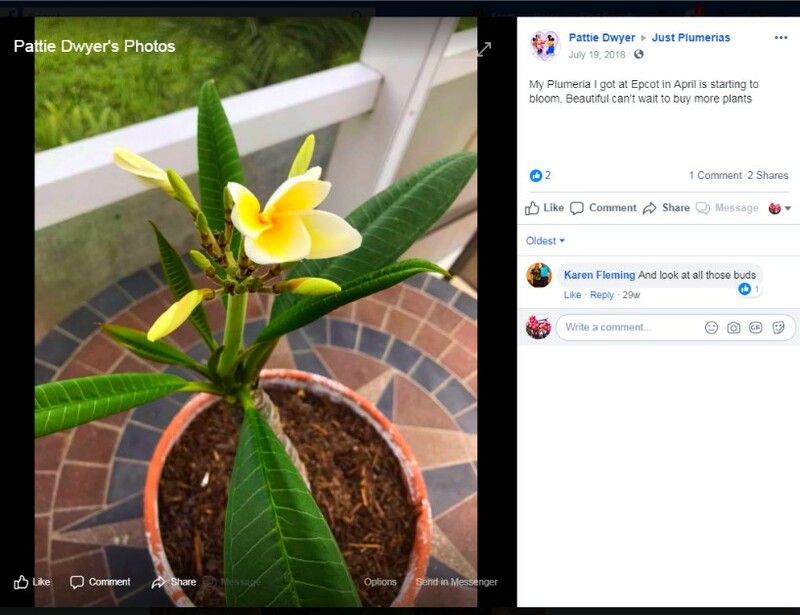 Mildred C - Bought my plumeria cutting in Epcot at the Flower and Garden Festival in April 2017 and after lots of love and nurture got my first bloom this past week! Thank you Justplumerias.com !!! In love with our plumerias!!! Thanks for the business Mildred - great looking blooms. Plumeria Cutting I purchased at Epcot and smells like Suntan Lotion ! Short and sweet.... Just Plumerias delivered exactly what they said they would. The cuttings were well wrapped and packaged.It's just past 4 weeks now and the cuttings are doing really well. I followed their instructions to a T and I have beautiful plants starting! Thanks Just Plumerias, for the beautiful cuttings! I bought these plumeria cuttings at your location at Disney Springs. 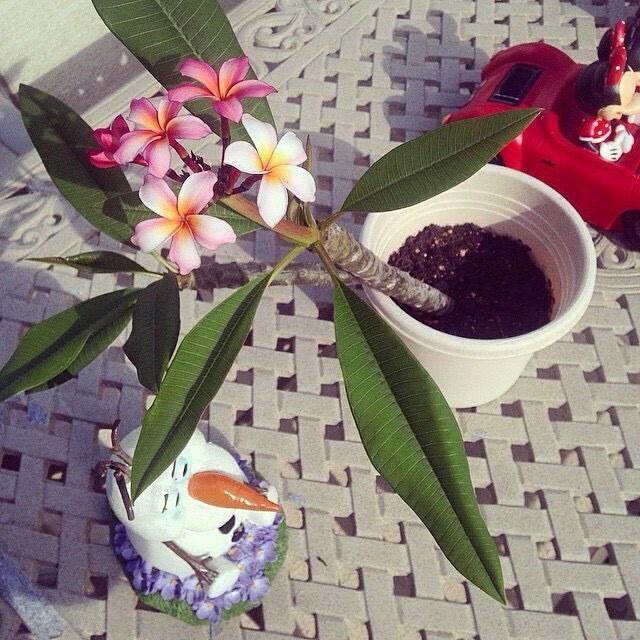 I planted it in sand like you instructed, and I got plumeria blooms in 6 months !! I did not do anything but neglected it !! I love the color of the plumeria blooms you carry. We sell the plumeria all over the world and not only does the plumeria grow up North, the plumeria blooms up North. My first Plumeria the plant of Love so proud about the result !!! I have ordered from this Just Plumerias 3 times. 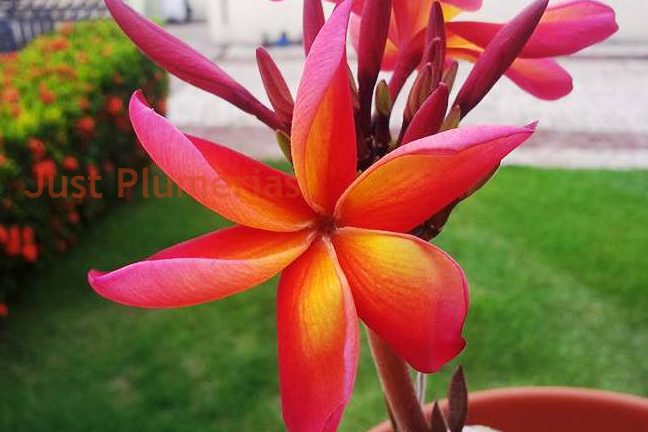 I keep ordering plumerias from them because the cuttings are great and the price cannot be beat. The last order I received was 2 double tips and 2 triple tips. Plumeria bought from us and is blooming in Maryland. Join the most active plumeria facebook page. JustPlumerias Facebook over 13,000 memmbers.